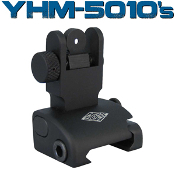 YHM's Quick Deploy Sight System features an automatic deploy system that springs the sight up with the push of a button. Both front and rear sights lock positively in the folded and deployed positions and are made from aircraft quality aluminum and hardcoated to military specifications. The rear sight is available with either a single large peep, single small peep, or dual peep aperture. When folded the sight measures just .435 inches from the rail.